The heart is a muscular pump divided into four chambers. There are two, thin walled upper chambers, the right atrium and left atrium. These are separated by valves from two muscular chambers, the right and left ventricles. The ventricles perform most of the heart�s pumping function. The right atrium receives blood from the veins in the body and transports that blood to the right ventricle. The right ventricle is responsible for moving blood to the lungs, where it will pick up oxygen. The left atrium receives this oxygen rich blood from the lungs and transports it to the left ventricle. The left ventricle pumps the oxygenated blood to the body. There are four valves in the heart. The tricuspid and pulmonary valves are on the right side of the heart, and the mitral and aortic valves are on the left side of the heart. All valves resemble flaps, and each valve is made up of segments or leaflets. 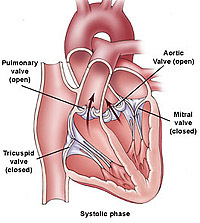 The valves open and close to keep blood flowing through the heart in only one direction. The heart is a muscular pump divided into four chambers. The two main muscular chambers, called the left and right ventricles, perform most of the heart's pumping action and are located on the bottom part of the heart. Two thin walled chambers, the left atrium and right atrium, are located on the upper part of the heart. The right atrium receives blood from the veins in the body and transports blood to the right ventricle, and the left atrium receives blood from the lungs and transports it to the left ventricle. The right ventricle is responsible for moving blood to the lungs, while the left ventricle moves blood to the rest of the body. The valves between these chambers control the way that blood flows through the heart. The tricuspid and pulmonary valves are on the right side of the heart, and the mitral and aortic valves are on the left side of the heart. All valves resemble flaps, and each valve is made up of segments or leaflets. The valves open and close to keep blood flowing through the heart in only one direction. On the left side of the heart, oxygenated blood returns to the left atrium from the lungs. During the resting phase of the heart cycle, the left atrium contracts, and blood flows across the mitral valve to fill the muscular pumping chamber, or left ventricle. A heart beat occurs (and a pulse is felt) when the left ventricle contracts. During left ventricular contraction, the mitral valve closes, preventing the flow of blood back into the lungs, and the aortic valve opens, allowing blood to flow forward into the aorta, the main artery carrying blood to the rest of the body. A normal aortic valve has three cusps, or leaflets, that open widely to allow blood to flow forward, and close together tightly to prevent the backflow of blood into the left ventricle. In this way, a normal aortic valve allows blood to flow easily in one direction. Aortic valve disease occurs when the valve is unable to open or close properly. Common aortic valve problems are aortic stenosis (restricted opening) and aortic regurgitation (inadequate closing or "leak"). Aortic stenosis. Aortic stenosis is the narrowing of the aortic valve, which can lead to obstruction. This condition prevents the valve from opening properly and slows down blood flow from the left ventricle into the aorta. Though the heart may initially be able to compensate and move blood past the obstruction and into the body, the left ventricle is forced to pump harder, which over time can thicken and enlarge the heart muscle. If aortic stenosis becomes severe the heart may weaken and begin to fail. When the aortic valve is narrowed, it can be hard for the heart to supply increased blood flow to the body during effort, as it normally should. Aortic regurgitation. When the aortic valve does not close properly between heartbeats, the valve is termed �leaky�, �regurgitant�, or �insufficient�. These terms are synonymous. In this condition blood leaks backwards from the aorta into the left ventricle during the resting phase of the heart cycle. When a large amount of blood leaks back into the left ventricle with each heartbeat cycle, it must be pumped out again with the next heartbeat. This strains the left ventricle, which may enlarge and stiffen because of the increased work. If the pumping ability of the left ventricle begins to fail, the ventricle will become less able to also accept blood as it flows in from the left atrium, causing a buildup of pressure in the left atrium and, consequently, the blood vessels in the lungs. Symptoms of congestive heart failure (CHF): In CHF, the heart muscle is enlarged, weakened, and unable to pump an adequate amount of blood to the body. Fluid build-up in the lungs may occur in response, leading to shortness of breath. In milder forms, this shortness of breath may be limited to exercise, but in more serious forms it may occur at rest, or when lying down. Poor pumping of the left ventricle also limits the patient�s ability to exercise and causes fatigue. Chest pain: Chest pain, is another symptom of severe aortic valve disease. A diseased aortic valve increases the work the heart must perform. The heart is a muscle that requires its own supply of nutrients and oxygen, delivered by the coronary arteries. Chest pain may occur when the amount of work required of the heart exceeds the ability to deliver adequate oxygen and nutrients to the pumping muscle. Fainting (syncope): Blood flow through the aortic valve may become impaired enough to cause a transient decrease in blood flow to the brain. When the brain does not receive enough blood flow, fainting may occur. Aortic regurgitation. People with mild or moderate aortic regurgitation may not experience any symptoms. When aortic regurgitation becomes more severe, they may experience increasing fatigue, shortness of breath with effort, or more severe signs of congestive heart failure. As the heart enlarges, they may also become more aware of their own heart beating, and may experience palpitations, or abnormal heart rhythms. Aortic stenosis. Aortic stenosis affects 5 out of 10,000 people in the United States. The condition can either be congenital, which means present at birth, or acquired because of diseases that affect the aortic valve. In congenital aortic stenosis, a malformation occurs in the aortic valve. For example, some people are born with an aortic valve that does not have the normal three cusps or leaflets. These inherently abnormal valves can be highly susceptible to damage and to the buildup of calcium deposits on and around the valve. Acquired aortic stenosis occurs when a normal aortic valve becomes calcified, stiff, and narrowed over time. Recent studies suggest that the same processes that lead to atherosclerosis (hardening of the arteries) may contribute to the narrowing of normal aortic valves. In atherosclerosis, deposits of cholesterol-laden plaques build up in the arteries, stiffening and narrowing them. Acquired aortic stenosis is most common with advancing age (age 65 or older). Rheumatic fever may also lead to aortic stenosis. This is a rare condition that occurs in childhood following a bacterial (�strep�) throat infection. This leads to inflammation of the heart valves during the acute phase, and thickening of the valve leaflets during the recovery phase of the illness. Aortic regurgitation. Aortic regurgitation commonly occurs when the valve leaflets are damaged or destroyed, or when the base, or root, of the aorta enlarges. If the base of the aorta enlarges, the ring (or annulus) of tissue that holds the aortic valve also enlarges. Since the aortic valve leaflets do not grow, if the annulus enlarges, the leaflets may separate and not form an effective seal. To diagnose aortic valve disease, the physician reviews the patient's medical history and performs a physical examination. During the examination, the physician listens with a stethoscope for sounds of abnormal blood flow through the heart (heart murmurs). The findings made during a medical history and physical examination are typically confirmed through tests such as chest x rays, echocardiography, cardiac catheterization and angiography. Chest X-Ray :the size and contour of the heart can provide important clues to the physician regarding aortic valvular disease. Sometimes, valvular calcification can also be seen. Echocardiography : Using high-frequency sound waves called ultrasound, echocardiography produces an image of the heart on a monitor. Also known as an echo, this image can provide physicians with more precise information about the function of the aortic valve than a chest x-ray. For example, the physician may be able to see a congenitally malformed valve or one with significant thickening. Physicians also use echocardiography to detect enlargement of the left ventricle or to reveal if the left ventricle does not contract adequately. A form of echocardiography, called Doppler echocardiography, measures sound waves that bounce off of blood cells as they flow through the heart's chambers. This test helps the physician determine if heart valves are leaky or narrowed. Color Doppler uses a computer to color-code the speed and direction of blood flow through the heart and can help identify valve problems that cause abnormal blood flow patterns. Cardiac catheterization and angiography: Physicians use cardiac catheterization and angiography to confirm the extent of aortic valve disease, especially for people who may need surgery to correct a valve problem. Cardiac catheterization involves the insertion of a long, thin tube called a catheter into an artery in the leg or arm. The catheter is advanced through the arteries to the heart. Once the catheter is inside the heart, the pressure in various chambers is obtained. The difference in pressure between the left ventricle and the aorta will indicate the degree of aortic stenosis. During angiography, the physician injects contrast dye through the catheter. The dye is visible on x-rays, and produces a road map image of the heart and its blood vessels. This image is called an angiogram. The angiogram can reveal coronary artery disease (areas where the heart's arteries are blocked by plaque buildup), which is important for physicians to know before valve surgery. Approximately 50 percent of people with acquired aortic valve disease also have blockages in the blood vessels supplying the heart (coronary heart disease). People with mild or moderate aortic valve disease may not require any treatment to manage their condition, although physicians often recommend that people with moderate or severe valve problems refrain from severe physical exertion, such as competitive sports or weightlifting. In severe cases of aortic valve disease, valve replacement may be required. Valve replacement is an open-heart surgery procedure during which a surgeon removes the entire defective valve and sews a replacement valve into the ring of tissue that surrounds the opening of the aorta. For severe aortic stenosis, surgery is usually reserved until the patient develops symptoms. In severe aortic regurgitation, however, surgery may be advised even when symptoms are absent, based upon abnormal squeezing function or increased size of the left ventricle. Replacement valves can be harvested from human cadavers or from animals, or they can be mechanical metal and carbon fiber valves. Patients that receive a mechanical valve require lifelong anticoagulation with a blood thinner such warfarin (Coumadin�). Patients with severe aortic stenosis who are not considered to be good surgical candidates may be offered treatment with balloon expansion of the tight valve. This procedure, performed in the catheterization laboratory, involves threading a wire up the artery in the leg and across the narrowed valve, followed by insertion of an inflatable balloon over the wire. The balloon is advanced and positioned within the valve opening, and then inflated, cracking the valve open. This procedure is not considered definitive treatment of aortic stenosis, and carries a significant risk of complications, but in selected cases it may be used to allow a patient to improve enough to undergo surgery at a later date.